In addition to classic and hobbled, there are other styles of Roman shades. We have the London shade, relaxed Roman, Austrian shade, balloon shades, and the mock Roman. London shade: There are several styles of London shades (sometimes they’re called dog ear shades), as you can see in the illustration below. The shade is strange on the sides, leaving few inches on each side, which will cause the sides to stay loosely hung, resembling a dog’s ears. This type of shade has fabric “falling” in a series of puffy swags that are created by vertical rows of shirring. Austrian shades are formal, traditional, and expensive to create because they are laborious to construct. They represent a combination of two popular types of window covering – swags (or festoons) combined with the Roman shade style, to enable the shade to be lifted. Note: One point I would like to make is that the sides of the shade have the tendency to cave in, creating bowing on each side of the window. To remedy that situation, side panels are often used to hide the not-so-pleasant look of the caved-in sides. The image below is by Key Decorators. It illustrates how the sides of the shade can cave in. The image above is by Key Decorators. It illustrates how the caved sides of the shade was remedied by installing side panels to cover the sides. Relaxed Roman shades look very similar to the flat Roman shade, except the lower edge has about three pleats and a bar is inserted to allow the pleats to hang in a relaxed manner. The top remains flat and it will lift up and down easily, leaving the pleated bottom to bow and creating a valance-like effect. One can be creative with these shades by adding fabric trims, beaded trims, and fringes of many different types to enhance the décor and reflect the homeowner’s personal taste. Note: If banding is used, one must make sure it does not disappear in the folds. Personally, I might add the bands to the sides and leave the lower edge without any banding. Add banding, tapes, or braids on the seams to hide them. “Railroad” the fabric (use the width of the fabric for the length). That will give about 52 inches for the length. 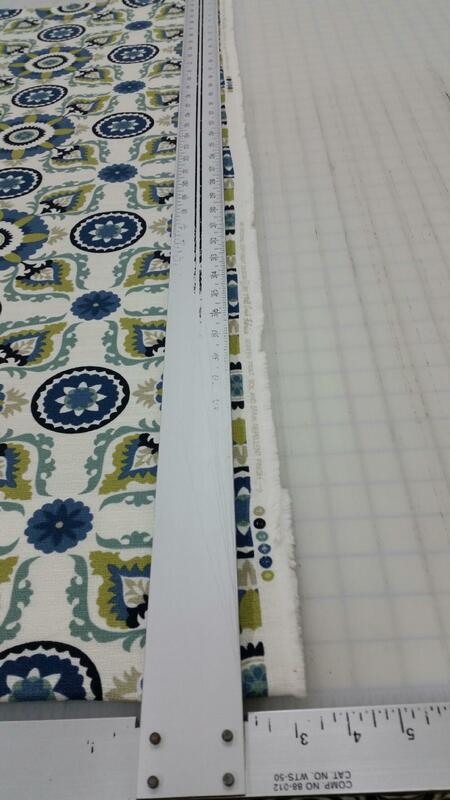 If the window is longer than 52 inches, an additional fabric can be added and seamed together. That will work with hobbled Roman shades and the flat Roman shades. For more information or to book a free consultation and an estimate call (630)420-0800 or (630)854-9082. Different styles of Roman shades for different spaces. What style works for you? Roman shades are increasingly popular. Over the past few years, we’ve seen them installed in a variety of settings—including suburban homes with traditional décor, urban townhomes with contemporary flair, and professional offices with business-like furnishings. We’ve also noticed Roman shades featured in dozens of magazines and books related to interior design and the window coverings industry. What makes them so versatile is that they’re available in a variety of styles, colors and lifting systems. Over the next few weeks, we’ll explain different styles of Roman shades and provide details about their advantages, how to use them, and which styles would coordinate well with the existing furnishings in any given space. Most certainly, not every style is suitable for every space or room. My goal with this series of blog posts is to show several styles of Roman shades and provide examples of where they would best be placed in a home or perhaps a workplace. Before describing styles, I should mention that the style names might be different from one fabricator to another; therefore, I’ll include images or sketches to identify each style and the best way to use them. Every week I’ll present one style and, as always, I welcome your comments and questions! ”Flat” describes the look exactly. These shades are rectangular-shaped with two or three folds at the lower edge. These shades can be interlined to enhance the look, or sometimes interlining is used to save energy. In some cases, such as in bedrooms and media rooms, shades with black-out lining are used to keep the room dark. Among the advantages of flat Roman shades is that they are moderately priced, so they fit into most budgets. As for Roman shade lifting systems, the simple cord-lock system or a continuous cord loop is often used. However, we’ve seen growing use of cordless Roman shades, which provide a “cleaner” look that is also safe for children and pets. One disadvantage of motorized shades is that they can appear too plain or a bit boring. When drawn down, they can look like a simple rectangular piece of fabric is installed over the window, adding no real “warmth” or style to the overall look of the room. To remedy that and provide a more finished look, we frequently add side panels made from fabulous, textured fabric to create depth and add visual interest to the room. Adding extra pleats at the bottom of the shade, using banding or any sort of embellishment, or using a valance provides a more dressed up and finished look. (Think of a contemporary painting on a simple canvas. By itself, it may look good, but with the right frame, it can look stunning. Let us help you make a stunning statement with your window treatments and other home furnishings. Call or email or leave a comment. Call (630)420-0800. Or (630)854-9082. Also, visit houzz.com and take a look at our profile under Gailani Designs. Roman shades are very popular now a days. One advice when selecting your fabric, make sure, to use plain or vertical stripes cottons. Cottons are preferable, they are an excellent fiber for roman shades. Avoid print with horizontal repeats, such as floral or geometric prints, plaids, or any print with horizontal repeat that was printed, and the print does not match the grain of the fabric. In this case the roman shades will appear crooked when hung, and which will not look proper! Other fibers can be used such as polyester blends and some silks. It is always a good idea to ask a window covering professional if you are in doubt! See the picture below, the print is off by approximately one inch.